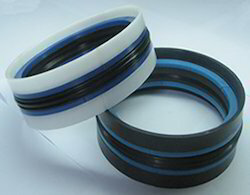 K18 is a five piece double acting compact seal consisting of one elastomeric nitrile rubber sealing element, two polyester elastomer back-up rings on both sides to prevent extrusion into the sealing gap and two special profil guide rings made of thermoplastic to absorb transverse forces. Ours is a reputed entity, prominently indulge in catering the clients with a superior range of Top / Bottom Entry Agitator Seals. These products are extensively used in different types of plants, driers and mixer and industries like chemical, pharmaceuticals, food & papers processing. We have carved a niche amongst the most trusted names in this business, engaged in offering a comprehensive range of Compact Rubber Seal. The Compact seal is a pressure-tight system.The Compact-ring seals the annular space between the carrier and the casing pipe or the core drilled hole against water, gas or other media. It offers ideal sealing for wall opening of gas, water and sewage pipes as well as for cables. Temperature: -30 to +100 Deg.C. 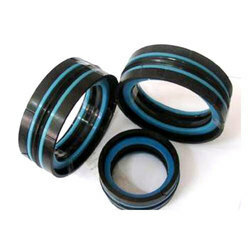 Our organization is considered a reliable provider of an extensive range of Compact Piston Seal. Offered product is made in accordance with the set industry lines at our unit. Due to their strength and reliable performance, these products are highly demanded in several industrial areas. We provide these in various specifications as per the demands of the clientele. Compact seals is practically unlimited and many different versions are available to meet every need, be it for jumbo container carriers or luxury yachts, cruise liners or inland waterway vessels, submarines or supertankers.